Do you feel anxious each time a utility bill arrives in the mail? Do you nervously open it to see how much energy you used? A few simple changes to your habits will make opening your bills less stressful while helping to save money. Here are 10 tips to save on your utility bill. One important step to take when looking to save money on your utility bill is to begin tracking how much you spend each month on gas, electricity and water. Watching your habits from month to month (and at different times of year) will not only help you to plan your budget around your energy needs, but will also help you notice inconsistencies. Unusually high bills may mean that you have a leak that needs to be addressed. You may find these 15 FREE Budget Planning Printables useful for tracking your expenses. If you find that you have leaky faucets, minor gas leaks, etc. get them fixed immediately. Each day that you go without a leak being fixed you may be causing damage to your home while losing money on the water (or gas) being lost. Making a habit of paying your bills the same day (or two days) each month will help you to keep on track with your payments. Paying on time will help save the added expense of late fees while helping to improve your credit history. If you find it difficult to remember when your bills are coming due, autopay may be a good option for you. Talking with your utility companies will help you determine your best payment plan. This tip goes without saying. Make a habit of turning off the lights or TV when you leave the room. Cut down on how long you’re in the shower and turn off the water when brushing your teeth. These simple steps can save you a bundle while being more environmentally conscious. If possible, plan the times that you’ll use the most energy and schedule them for “off” times. Rather than running the oven during the heat of the day, wait until the sun isn’t so high in the sky. Coordinating your oven use with the weather will keep your home cooler, meaning less energy used to cool your home. Your utility companies may also have prime times for use (meaning higher pricing.) Waiting to water your garden or do the laundry until off hours will also help you save. Make sure that you clean your appliances and follow their proper maintenance schedules. This information is typically found in the owner’s manual. Keeping your appliances running smoothly will mean that they don’t use any extra energy to run. We all like to be comfortable in our homes. That doesn’t have to mean, however, that your house has to be at your ideal temperature. During the summer months bump the thermostat up a couple of degrees and wear shorts and a t-shirt inside. Cooler months can mean keeping it a bit lower and wearing a sweater. Dressing for the weather and bumping your home’s temperature a couple of degrees is another way to help you save. When the weather is warmer, keep all possible doors open during the day. This simple change will allow air to circulate throughout your home, helping your house to be more comfortable and allowing your thermostat to work more efficiently. When your heating and cooling system is running at its best, you’re able to save more. Do you find that your family doesn’t make turning off electronics, the lights, etc. a priority? Do they always seem to leave the lights on? If so, make a game out of it. Give each person a (negative) point for each time they forget to turn something off. At the end of the week, the person with the fewest number of points will have earned a predetermined prize. It keeps this money saving goal fun while making it a family priority. 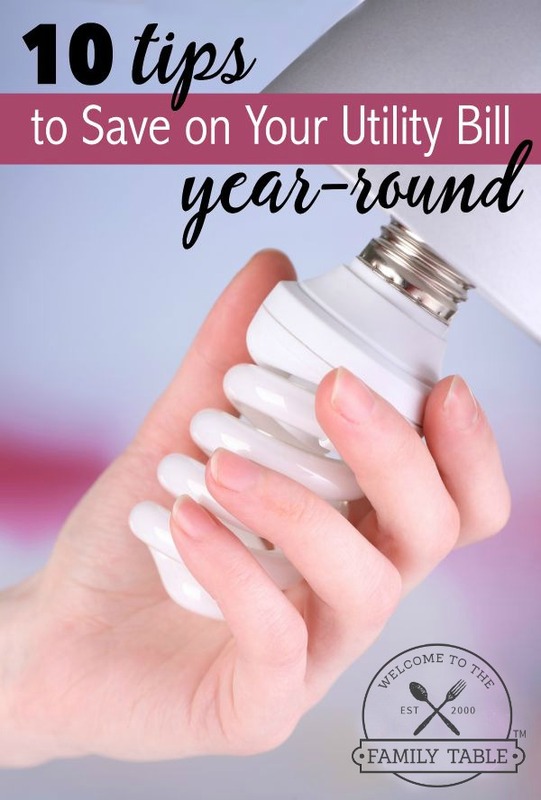 Do you have other tips on how to save on your utility bills? Please share what works for you.